Our back forty is a managed forest that grew up from abandoned pasture over the past 80 or so years, typical of the small privately owned timber parcels here in Vermont. Along the steep banks of Fargo Brook that divide our homesite from the woodlot eastern hemlock and yellow birch predominate while the bench above that slopes west toward the Huntington River is stocked mostly with white pine, black cherry, maple and yellow birch mixed with some hemlock, butternut, ash , aspen and the occasional beech, hornbeam and white or gray birch. We have harvested over 100,000 board feet of mature white pine over the years including the lumber for our house and shop and more recently our son Miles’ timber-framed house. When we moved here in the mid 80’s there were half a dozen huge old sugar maple trees hanging on. Most have given up the ghost. One old giant I had cut down about 15 years ago, five feet in diameter at the base and hollow at the center, yielded some 600 board feet of quartersawn material, curly and solid at one edge shading through some spectacular spalted figure to punky at the inner edge. One of those trees remains standing for now, and another died a couple of years ago but part of the trunk was still vertical. I had asked Miles to help me take down the big maple as it appeared to be reaching the end of its life. On second look, it seemed more vigorous than I had thought so we left it for another year and decided to salvage the remains of the dead trunk. It’s always a crapshoot with timber like this, but the prospect of some useable spalted wood tipped me over the edge. 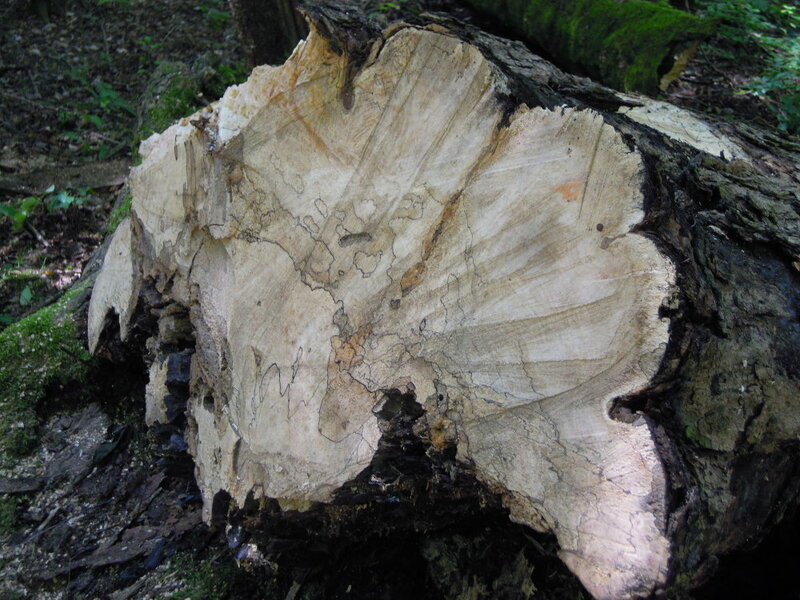 Spalting is a decay process in wet wood caused by fungi. If it goes far enough the wood becomes rotten and useless, but if halted by drying at the right point it can add exceptional patterns to the material with fine "zone lines" like pen and ink tracery. Miles cut the standing trunk and pulled out several chunks that had been on the ground for a year or two, surprisingly solid (and then again surprisingly weak when handled roughly). We wouldn’t know until it was sawn if the effort was worth it. There are dozens of cherry trees that took off early in the pasture overgrowth and have attained breast height diameters of 14-17”. One likely looking one was 150 feet or so from the dead maple, and Miles volunteered to pull that out as well. He notched and wedged it over in line with the path to the maple but as sometimes happens it hung up in a neighboring maple crown and had to be levered off the stump with a peavey before it fell to the ground. Miles cut the log at 29 feet, skidded it to the woods road and hitched it under his wheeled arch before towing it out to the landing. Several more trips got out the huge maple chunks on the tractor forks, and two trips across town with the flatbed Ford had the haul at Miles’ bandmill.